Ali Milani speaks at the 2016 NUS conference. Photo: MLF098 @ Wikimedia Commons. Zamzam Ibrahim, the incumbent National Union of Students (NUS) Vice President for Society and Citizenship, has been elected as the organisation’s new President. In accepting the role, she promised to lead a National Student Strike, based on a range of headline demands. These will include fighting for liberation campaigns and re-introducing the post-work study visa. The President-elect has also vowed to tackle rising tuition fees, and initiate a range of liberation campaigns, including anti-xenophobia and anti-racism movements. Speaking on her election, Ibrahim said: “I am immensely proud and humbled to have been elected as the next National President of NUS. Education is a transformative experience for millions in the UK and it is now time to make sure everyone is able to access that promise. 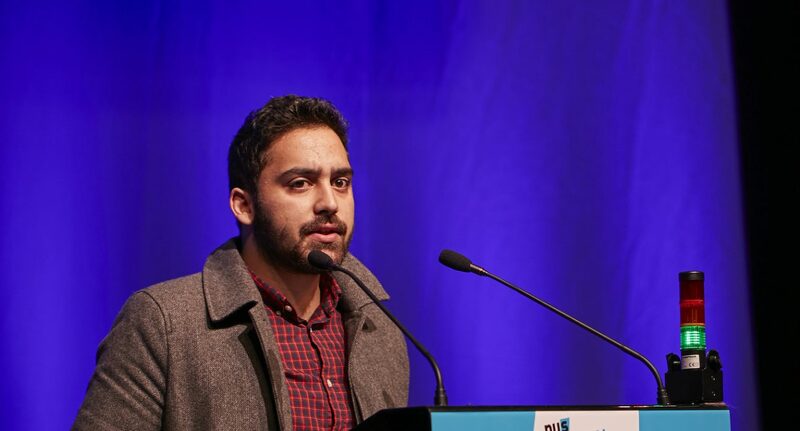 Ibrahim, formerly President of the University of Salford Students’ Union, ran on a platform of revitalisation of the student movement, claiming that transformative leadership was required to guide the NUS through a period of difficulty. Financial volatility has rocked the organisation in the last year, with widespread cutbacks and austerity measures needed to keep the body financially afloat. In January, 54 jobs were cut in order to urgently address a £3 million deficit reported in November 2018. These decisions sparked controversy, as the International and Trans officer positions were defunded as part of measures, as well as reduction in total elected officers from 20 to 12. The organisation’s London office on Grays Inn Road is also up for sale, to help ease debts. With the NUS now on a path of stabilisation, this year’s conference has proved more productive than the last, with a range of new policy proposals passed. A National Scrutiny Council was approved, which will function to examine the accountability and transparency of student officers. In addition, subject to the approval by the Company Law meeting, the NUS’s governance system will be divided into two branches, one to deal explicitly with students’ union development, and one to support student voice. The efficiency of the board has also been boosted by the introduction of the requirement of corporate expertise in decision-making moving forward. In addition to this, all staff at the Union will undergo mandatory antisemitism training, to reduce instances of discrimination. The approved changes provide a welcome step forward for the NUS, which has undertaken eight reformation consultations since 2014. Outgoing President Shakira Martin praised the changes enacted by conference, as she concluded the policy debate: “I am grateful to Conference for taking this momentous decision to endorse reform and deliver the vision of members. This vote sends a clear message that we have listened, heard and acted.